The Mythbuster guy! He’s doing a Q&A with himself, hopping from chair to chair. He says he’s been thinking a lot about Open Source, he’s been trying to think of what’s next. He sees an amazing thing happening with Make, Craft, Intsructables, Lifehacker, people are trying not only to parse their world, but take it apart. Someone always takes the hit to buy a brand new part and take it apart to its base parts. He started to look at analogs for that, and he looked at the car. He thinks we’re still in the Model A period of the computer, even though they’re ubiqutous, they’re still a lot of work. You have post-war America, you have people with some leisure time, rising middle class, so you had these cars that were great but they didn’t work as well. When people started working on their car they started making improvements. Industry started taking these improvements and incorporating them. That’s what happened in the 50s, and that’s what’s happening now. Endless websites devoted to modifying technology to fit your life better. Because of this massive community that is the web, you can connect from across the world. It’s a trope to say the web is a great community, to me it’s not the source of all knowledge, it’s a repository of discovery. I always knew the web was a great idea, I just hadn’t figured out what that idea was yet. There’s a desire to learn, the web is providing that to a huge capacity. When I first moved to New York I got addicted to dawn, so I slept like every third day. He stumbled upon Canal street when all these stores were opening, sounds like lots of parts stores. The web is like that on steroids. The show is inspiring a generation of schoolkids. There’s a sense of wonder in what we do, a sense of curiosity. There’s so much great, great stuff that it’s like a… in the 70s everyone started knitting, home crafts, my Dad made glasses from old wine bottles with this kit he bought, we’re having a resurgence of that. We have a hacker culture… hacker comes out of MIT in the 50s, the idea is a do-no-harm exploration of the world. We declared the American frontier completely explored in 1909, there’s a new frontier, like the duct system at your college. In the last five years, the hackers have met the knitters. They’re generating knitting machines that make Nintendo knits and stuff. 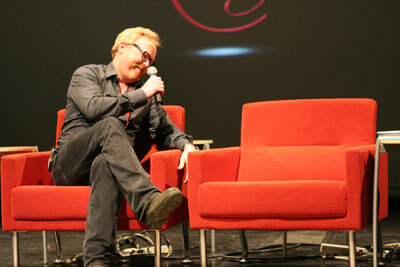 What do you plan to do after Mythbusters? The idea of Open Source, to call this exchange OS is to do a chicken and egg reversal. Science has always been open source, you do research, you figure something out, and you publish! Hopefully you don’t waste your thesis on something somebody did already in Germany. Open source is that exchange of ideas. When I think about what I’d like to do next, I posit a show that is an interface between TV, the web, to interface between what goes on the show and the audience, to develop really great ideas and build upon them, and those ideas are in the public domain. Whatever we do I’d like it to be an interaction with the audience, I’d like it to be free to the world, and I’d like to be able to improve ideas over time. My knowledge is for everybody. It’s not like other professions when you ask someone how they did something and they won’t tell you. This entry was written by Matt, posted on December 2, 2007 at 7:41 pm, filed under Session and tagged adam savage, eg2007, mythbusters, open source. Bookmark the permalink. Follow any comments here with the RSS feed for this post. Post a comment or leave a trackback: Trackback URL.